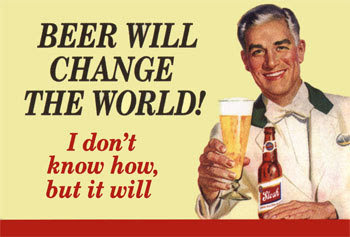 If I could offer you only one tip for the future, Beer would be it. The long term benefits of Beer, drunk in moderation, have been proved by scientists whereas the rest of my advice has no basis more reliable than my own meandering experience…I will dispense this advice now. Enjoy the power and beauty of your youth; oh never mind; you will not understand the power and beauty of your youth until they have faded. But trust me, in 20 years you'll look back at photos of yourself in a Bar and recall in a way you can't grasp now how much possibility lay before you and how fabulous you really looked….You’re not as fat as you imagine, Hey, but you are as fat as YOU LOOK! Don't be reckless with other people's hearts, don't put up with people who are reckless with yours. Drink their beer while they are in the restroom and leave. Floss, after eating bar snacks. Don't waste your time on jealousy, you don't live on the wonderful island of the UK so deal with it. You're never ahead, most times you're behind…the race is long, and in the end, it's only with yourself. So buy yourself a cold one. Remember the compliments you receive, forget the insults; if you succeed in doing this, tell me how, as i love dishing out insults, and I can always add that as a P.S. Throw away your old love letters and your old bank statements. Both will incriminate you if your present partner finds them. Get plenty of calcium. Guinness Yogurt is highly recommended. Be kind to your knees. You'll need them. Come the judgement day there'll be a whole mess of forgiveness to be begged for. Maybe you'll marry, maybe you'll just be lucky and won't, maybe you'll have children, maybe you'll be really very lucky and won't, maybe you'll divorce at 40 and head off on a 30 year road trip around the bars of the world, maybe you'll dance the funky chicken on your 75th wedding anniversary and really regret not doing the road trip while you had the chance…what ever you do, don’t congratulate yourself too much or berate yourself either – your choices are your own stupid fault, so are everybody else's. Enjoy your body, use it every way you can (fill it up with beer)…don’t be afraid of it, or what other people think of it, it's the greatest instrument you'll ever own.. even if it is just a tuba first thing in the morning on the throne. Dance…even if you have nowhere to do it except an alley, but take care not to spill your drink. Read the directions on the beer bottle, even if you don't follow them. Do NOT read beer magazines, they will only make you feel thirsty and frustrated. Get to know your parents, ask them for money, you never know when they'll be gone for good. Understand that friends come and go, but for the precious few you should hold on, and get them to get a round of drinks in. Work hard to bridge the gaps in geography in lifestyle because the older you get, the more you need the people you knew when you were young, to carry you out of the bar to your car. Live in New York City once, write poetry or a novel, but leave before it makes it hard to miss out on the fun when you do eventually go; live in England once, but leave before it makes you too happy. Accept certain inalienable truths, beer prices will rise, politicians will philander, there is nothing but the empty Void and you will get old, and when you do you'll fantasise that when you were young beer prices were reasonable, politicians were noble and children respected their elders...and the Void? oh that was still empty back then too. Respect your elders, unless you are 117, in which case, that's it bub...you can flip the finger!!! Don't expect anyone else to support you when you fall down in a bar. Maybe you have half shares in a brewery, maybe you have a wealthy spouse who has the other half. In which case, neither of you will run out, but will simply wait for the other to drop. Don't mess too much with your hair, or by the time it's 40, it will look 85. Use Beer Shampoo. Be careful whose beer you buy, and, be patient with those who pour it. Barroom pontificating is a form of nostalgia, dispensing it is a way of fishing the past from the disposal, wiping it off, painting over the ugly parts and recycling it for more than it's worth. No, sorry that's getting remarried. But trust me on the beer..
Great blog! It sounds more like a Quest list to me. Most of these I have experienced. Does having a wife from New York and living in England for 2 months count? Also, where do you buy beer shampoo? What a way to start the day! The official Knights of MSA Manifesto? It does read like a public declaration of principles and intentions. Before someone pulls me up on it... I have found out that the original anodyne Mary Schmich list which I heavily paraphrased for the KMSA, appeared in her coloumn in the Chicargo Tribune in 1997, and was not,as has been miss attributed on the internet, her commencement speech at MIT , or as being by Kurt Vonnaught.